Technology is changing every industry in significant ways. Technology is helping us all to live longer, healthier lives. From robotic surgeries to “smart hospitals,” the digital transformation is revolutionizing patient care in new and exciting ways. That’s not all as per Forbes, National health expenditures for example in the United States is nearly 18% of the country’s total GDP. IT in healthcare long defined by non-interoperable systems and inaccessible data is now changing; healthcare IT now elevates data usage and analytics across the board — to the benefit of patients, care providers, and hospitals. Predictive modeling and genomic sequencing are becoming components of fully digitized health organizations in partnership with the patients and communities. Digitization of healthcare records has paved the way for a far more informed, innovative, and personalized care paradigm. In the first part of this blog, we will look at some of the trends in healthcare digitization. When patient data is stagnant, stored in silos, it cannot be analyzed, compared, contrasted, and combined to deduce best practices and health trends or to provide real-time support tools for clinicians. Digitizing protected health information will transform personalized medicine, pharmaceutical innovation, and understanding of complication rates, genomic modeling, and more. Better data quality will mean better and more cost-effective healthcare. Most immediately, digitized records help care providers recognize warning signs for patients who may be on the verge of facing major health issues, thus averting expensive treatments and hospitalizations. It is even better when patient continuously receives the right support and preventive measures, the effect multiplies. The key is providing the right data to caregivers when and where they need it and to researchers and data scientists for discovering new protocols or health trends. Adoption of EHR systems has increased more than six-fold since the turn of this decade. Now, with ubiquitous access to electronic records makes 24*7 remote care possible and boosts opportunities for seeking alternate opinions and accessing evidence-based medical research. EHR data helps hospital management better understand ways to improve overall community health while making the best use of internal resources. 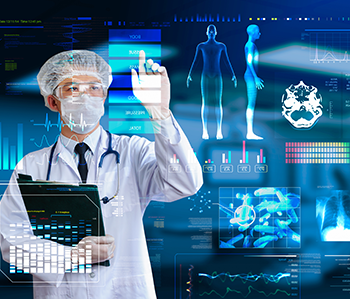 Hospitals and health systems will depend heavily on data-driven analyses of procedures and surgeries to shape best practices and provide value to both patients and hospitals. It’s predicted that the digital revolution can save billions in spending in the sector, especially in the area of chronic diseases. There is both a lot of value in bringing new technology to the healthcare market. Imagine a machine that helps manage well-being without paying a visit to a doctor’s office. Now, compact mobile devices can perform ECGs, DIY blood tests, or serve as a thermometer so no need to go to a doctor for that. With automation, patients can even be prompted to check weight, pulse, or oxygen levels, and input the results into mobile patient portals. They can also transmit the results to a doctor in real time. Those details, when entered regularly, can help predict one’s risk for heart disease and other illnesses, ultimately saving lives. Wearable technologies have a crucial role in the future of digital health as its adoption start increasing. They monitor vital signs, as well as body vitals like sleep quality and activity levels, to give users feedback on current body conditions and trends. Real-time patient vitals can be monitored through a mobile application, which can be supervised by caregivers. A Smart Glove that assists patients with neurological injuries regains mobility in their hands. Using a Bluetooth sensor, the glove measures the patient’s motion and creates an exercise schedule based on his specific needs. In future, wearable technologies might go beyond just being a wristwatch, fitness watch or smartwatch but would also be embedded into clothing such as T-shirts or socks or directly to the skin as a Band-Aid. There is little doubt that digital transformation will markedly change business is conducted. Many healthcare companies still run conventionally, on older technologies; siloed information; and complex networks. To achieve such a transformation, they will need to make critical decisions about new technologies and vendors that provide value and address your business imperatives. In the next part of this digitization in healthcare blog, we will look at some of the other technical changes that are taking place in the healthcare market. Contact us today to know more about how YASH can help you tackle the challenges that arise during a digital transformation. Great Article. Healthcare Digitization is the modern care. Today’s care management platforms include digital features and can identify risks and create truly personalized healthcare that’s unique to each individual.